Waverly and the other members of the Empyrean have been scattered, and their home ship destroyed. The mission to rescue their parents didn't go quite as planned, and now they're at an even greater disadvantage: trapped with their enemies on the New Horizon, trying to find a way to survive. Will Seth's health hold out long enough to help Waverly topple their enemy? And will Waverly find a way to unite her friends before the final battle? Nothing is certain and every second is a risk in this explosive finale. The wait between the end of Spark, and Flame’s release has been torturous. Spark, the second book in the Sky Chasers series, pretty much broke me. I had a breakdown on Goodreads, cried all over Twitter, and basically didn’t want to go on. I’ve been anticipating Flame for a year now, and I am happy to confirm that it lived up to my expectations. 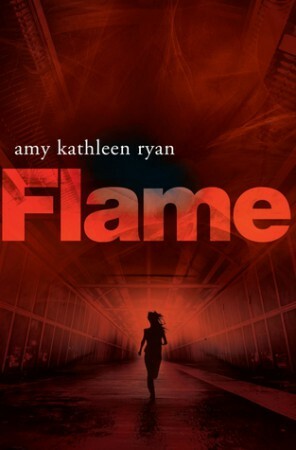 While I do not think Flame is the strongest book in the series – that title goes to Spark – I think that Amy Kathleen Ryan did a great job of providing an exciting climax, wrapping up her characters’ stories, and leaving the reader feeling some sort of closure. A lot of the time you don’t get that. I am often disappointed by endings, because I tend to build up the story so much in my head that it simply cannot meet my expectations. Flame did, though. Waverly is back, and she’s as badass as ever. She broke my heart in Flame, as she goes through so much, while still standing strong and trying to protect everyone that she loves. I adore her. She has such a huge heart, and really cares about her family and friends. When she saw her mother again for the first time in ages, my heart split in two. The same goes for when she came across old friends and allies. Waverly is definitely one of my favourite YA protagonists. Let’s get Kieran out of the way. I still despise him, and I don’t understand why certain other characters were telling him that he’s a good man, despite all that he’s done. He’s not a good man, he’s a complete arse who let power go to his head. I did enjoy reading from his point of view this time, because there was less religion, and more attempts at saving people. But I will not forgive him for what he has done. And then there’s Seth. Seth, who I kind of stan, because he’s so broken and epic. In the previous books, we learnt that Seth’s father was abusive and unloving towards his son, and I really liked how Amy Kathleen Ryan kept mentioning this fact, and having it affect Seth in such a way. It’s important to his character growth, and abuse really does stay with you forever. I loved how, in Flame, there were multiple different villainous characters. There were several different teams at play here, and many characters with questionable morals and mindsets. It kept the plot flowing, and there was always something going on, no matter whose chapter we were in at the time. Once again, Anne Mathers is intriguing and yet kind of vile, but we’re also introduced to several other levels of psychopath here. Even I found some scenes uncomfortable to read, and I read pretty much anything. There is an epilogue-type chapter which shows how the characters ended up, and for the most part I really liked it. I think Ryan pulled it off very well, and it gave me the closure that I needed. As well as a heart attack at one point because ASHES. If you’ve read the book, you’ll know what I mean. One thing that did bother me, however, was how all of the surviving characters had multiple children. The oldest character couldn’t have been more than twenty-five, and yet they already had a bunch of kids. One character had even just had their fifth child. Now, I don’t hate children, and I do think it would have been realistic to give a few of the characters some offspring. But this many kids in such a short space of time seems too much to me. The characters were teenagers when we left them, and no one on the ship had even hit thirty yet. I don’t know, it just felt like they were all having kids too quickly and too young, and as someone who doesn’t (currently) want children until she’s at least 28 or so, it weirded me out. It seemed as though Ryan was pushing the idea that having children in your early twenties is the way to go, and personally, that is definitely not for me. Overall, Flame is a fantastic book, and I’m very pleased with the way that it ended. The characters remain superb, and they’re definitely the top selling point for this series. The were several instances where I thought everyone was going to die, and I loved it. It kept me on my toes. Now I’m going to have to find another spaceship adventure to keep me occupied. I haven’t even heard of this series before. The synopsis sounds real good though so I’m avoiding reading your review as this isn’t the first in the series! *sigh* Another to add to the TBR list. I’ve not read this series, but I’ve been eyeing it for a while. I know what you mean about endings, but I’m glad this one was a good one for you. I want to start series just so I can read the second book to know why you got so emotional lol Great review 🙂 I series need to consider getting the first!